The 22m f/2 STM lens is a small little wonder. It's so small and compact you wonder just how good it might be. If you want to skip to the How's it Perform? section below, go ahead, but I'll give you some foreshadowing: this is a lens you don't want to ignore. At 3.7 ounces (105g) and only ~1" (23.7mm) in length, the 22mm f/2 is a diminuitive lens, enough so that you'd call it a pancake lens. On the already smallish EOS M bodies you get a pretty tiny, easily jacket-pocketable combo that effectively takes on cameras such as the Fujifilm X100T. Physically, it's a simple lens. Only 7 elements in 6 groups, and just one aspherical element, so nothing really special in terms of the optical formula. The aperture diaphragm is 7-bladed, though rounded. There's no depth of field scale. The lens has a focus ring out front that is thin; so thin it seems like it's barely there. The lens uses 43mm filters. An optional EW-43 lens hood is available. Surprisingly, the lens focuses quite closely at 5.9" (.15m), which provides a maximum magnification ratio of 1:4.7. While Canon labels this "Macro," it's not really all that macro. Nevertheless, the ability to move in that close to a subject at this focal length does allow a great deal of perspective versatility you don't always find in the pancake-type primes. Given the EOS M cameras' 1.6x crop ratio, this lens works out to be a 35mm equivalent lens. Not significantly wide, but wider than a normal lens would be. The lens is available in both black and silver and is made in Taiwan. List price is US$250. If it weren't for the hood/cap design, there'd be nothing to talk about here. The front focus ring is fly-by-wire, but smooth. The hood is removable, but I'm not sure why you'd remove it should you purchase it. First of all, it's really minimal, adding barely a quarter inch to the length of the lens. The supplied front lens cap fits both the lens without the hood and the lens with the hood mounted. 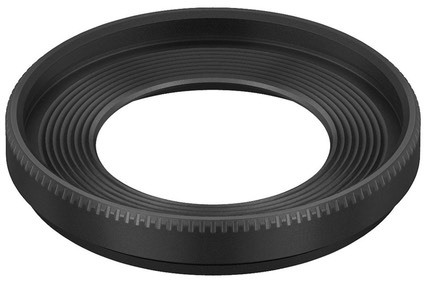 Moreover, the hood repeats the 43mm filter ring. I'm not sure whether to praise or condemn the Canon engineers for this design. It's brilliant, but was it necessary? By my calculations they could have just extended the front of the lens by 3/8" and made a virtual hood via front element recession design. Autofocus: As you might expect from a small, simple, prime lens, autofocus is fast. In some ways this is the fastest autofocusing lens in the EF-M lineup, and that's probably due to the simplicity of the optical design coupled with how little mass is moving such small distances. Focus is virtually silent. Sharpness: Holy cow, Canon! The center is always excellent, even wide open (though the best sharpness is at f/4). The extreme corners are pretty terrible at f/2, fair at f/2.8, and very good or better at f/4. But that's the extreme corners. And that's almost certainly due to a small bit of field curvature. The nearer edges (short axis) actually look good to me at all apertures, again with f/4 probably being the sweet spot. Do watch out for close subjects, though. The field curvature contribution is higher when you use the lens at its closest focus distance, and I've seen some results at the minimum distance that are less impressive. Expect excellent sharpness in the center no matter what, but you'll need to stop down to pull in the extreme corners. Simple as that. Indeed, just like the old days. Linear distortion: totally ignorable, with an extremely slight pincushion. Vignetting: Like the other Canon EOS M lenses, this seems to be where Canon cut its main corners. There's one and two thirds stop of vignetting in the corners at f/2, a bit over one stop at f/2.8, still near one stop at f/4, and you never ever get down to two-thirds of a stop. In other words, this lens always vignettes, and it's not at ignorable levels. Chromatic aberration: lateral chromatic aberration is present and corrected by the camera. Pretty much a pixel's worth across the entire aperture range. There's a bit of longitudinal CA present, but not enough for me to get worried about. This little lens is one of my favorites on the EOS M5 or M6. 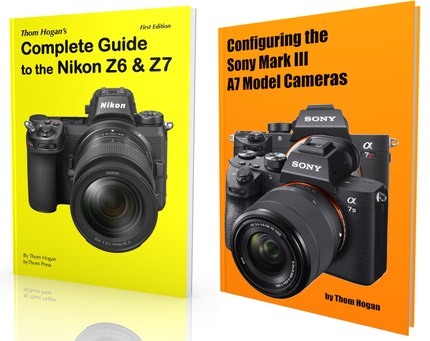 It's right at the classic 35mm focal length that a lot of shooters favor for from-the-hip type shooting, and that's exactly what I find the combo great at. The EOS M5 with 22mm fits easily into my jacket pockets and makes for a great street or casual shooting combo, and the results will really never disappoint you. Indeed, I don't know why every Canon EOS M user doesn't own this lens (similar to why I don't understand why some Nikon DX DSLR users don't own the 35mm f/1.8G DX lens). It's small, it's not expensive, it performs nicely, it allows you to strip down to a pocketable camera/lens combo that's good, and it's just a lot of fun to shoot with an APS-C sensor camera/lens that's insanely small and can handle lower light situations well. Remember, this lens is excellent in most of the frame even at f/2.